Welcome to Make It Monday with Kraft Outlet. Use this week's Reuse/Recycle", theme to inspire you to create your project and then link it up at the bottom of this post before 6:00 p.m. (Eastern Time) on Sunday October 14, 2012. All of our followers who participant in our challenges this month have a chance to be featured on our "Feature Me Fridays" posts as well as be entered to win a $15.00 Kraft Outlet Store Voucher! The more challenges you enter this month, the more chances you have to win! For the Recycle/Reuse Challenge this week, Tammy created a treat bag altered from a Light Kraft Envelope. Tammy used her pinking shears to trim the top of the envelope to create an opening. She embellished with a darling tag that was die-cut created from a box headed for the recycling bin that was embossed, painted, distressed, and sanded. She used Lunch Bag Kraft Cardstock to die-cut a circle to create a sentiment. Tammy used the Buff Ivory Labels to personalize her goodies. Please visit Tammy's blog Creating Somewhere Under The Sun for additional pictures on her recycling project. One way to 'recycle and reuse' is to just use all the scraps and bits and pieces you have in those drawers and bins in your craft room. Another is to pick up products with other uses and 'repurpose' them into something altogether different. That is what Becky Garrison did for this week's project. She used four chipboard coasters from a restaurant to make the pages of a mini album, and a fast food restaurant's 'ketchup cup' to make a bright yellow sunflower for the front. She also used scraps and bits of card stock and ribbon, canvas and burlap and corrugated cardboard. The covers of the mini album are made of C-Flute Corrugated Kraft Paper. For more info and to see pictures of the inside of the album, please visit Becky's blog. 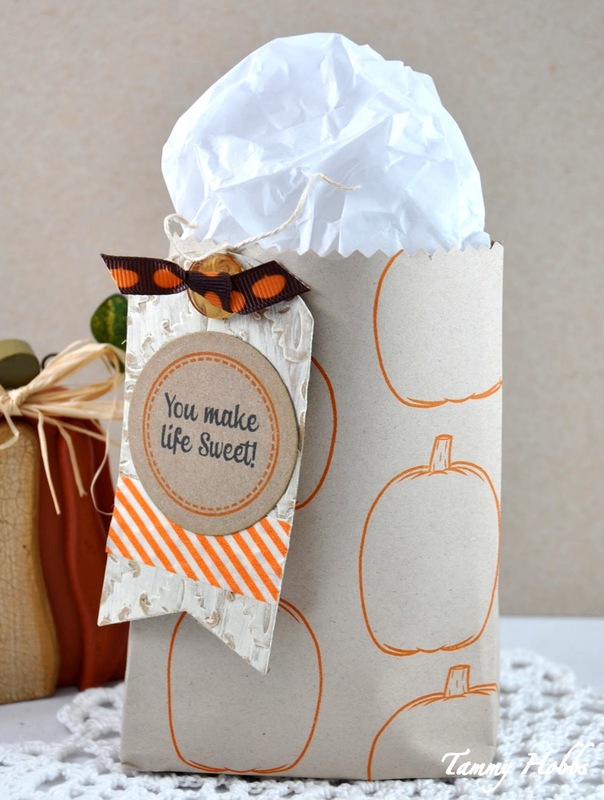 For today's 'Reuse & Recycle' challenge Debbie created some cute Halloween-inspired smores treat bags! For the kraft coffee bags, corrugated cardboard and tea-stained tags, you can use items found around your home - reuse and recycle -- but if you don't have any of the items on your project list around the house, you can find all the supplies needed to make these bags in The Kraft Outlet Shop! First Deb cut a window out of the front of each Small Kraft Coffee Bag using a label die and then added a clear acetate window inside the bag to hold the smores goodies (a ghost peep, two graham crackers and a chocolate bar). You can use a piece of clear acetate that comes on the packaging of many items purchased from stores these days. Next, Debbie folded a paper doilie over the top of each bag and secured it closed with a Black Wooden Clothespin. Debbie created a pretty nosegay with fabric flowers, leaves cut from Corrugated Kraft Paper and inked with cream paint, gold glittered Chip Board stars made with a star punch, two Antique Stick Pins, Orange and Black Baker's Twine ... and sweet X-Small Grungy Prim Tags - stamped with spooky sentiments using stamps from Paper Sweeties! Please visit Debbie's blog, Simple Treasures, to view additional pictures of these sweet treat bags! Like the wonderful DT recycled creations. Cannot go wrong with treats; especially s'mores. Like recycling items. First thing I recycled is a shoestring. Hope my hubby was not needing the extra shoestring. 2nd thing I recycled is the shiny paper that comes inside the Scotch ATG adhesive refill tape box. Discovered that the shiny paper cannot be sstamped on; at least I could not stamp on it even with StazOn ink which usually stamps on most all non regular cardstock items. What a great challenge! I need a way to use up all of my scrap paper, so I just entered a card I made using only scraps. Just made it, with 5 minutes to spare! Thanks so much for the fun challenge and LOVE LOVE love the halloween treat bags.